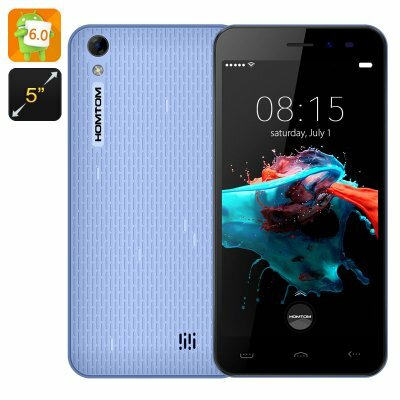 Successfully Added HOMTOM HT16 Smartphone - Android 6.0, 5 Inch HD Screen, 3G, Hot Knot, MTK6580 Quad Core CPU (Blue) to your Shopping Cart. The HOMTOM HT16 smartphone sports Android 6.0, a 5 inch HD screen, 3G on two SIM cards, a quad core CPU and more. Make full use of the HOMTOM HT16’s features and enjoy the latest interface — Android 6.0 on a large 5 inch screen. With Android 6.0 come lots of upgrades from lock screen and a new app drawer to the 200 new emojis. Enjoy Play Store access for even more functionality. The 5 inch HD screen lets you get the most out of the experience, with great quality media viewing, web browsing and more. The smartphone comes with 3G support and 2 SIM card slots — so communication won’t be a problem. The MTK6580 Quad core CPU will keep things rolling fast and you can multitask to your heart’s content. The 3000mAh battery provides 8 hours of non-stop talking plus 72 hours on standby. The phone comes with the basic 8GB of internal memory — but you will have the option of adding up to 128GB more to that on an SD card. With Bluetooth 4.0 support, you can also benefit from easy wireless connectivity — hook up speakers, headphones, smart watches and more.